I camped out at Macedonia Brook State Park this weekend. During the day I decided to take a ride over to The Sharon Audubon Center which was within close driving distance. There are several well-marked trails on the property. with a couple of nice ponds on property. 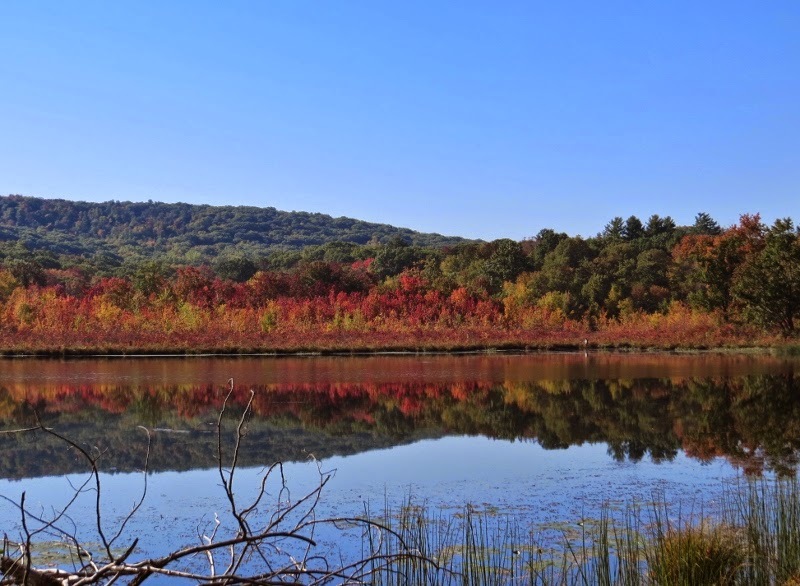 The progression of fall foliage was still in the early stages. They had a blind conveniently set up on the edge of the first pond. I was able to get a good view of Wood Ducks from this location and imagine that it would come in very handy once some of the migrating ducks arrive. The second pond featured boardwalks and benches set at the edge of the pond making my birding experience very comfortable. 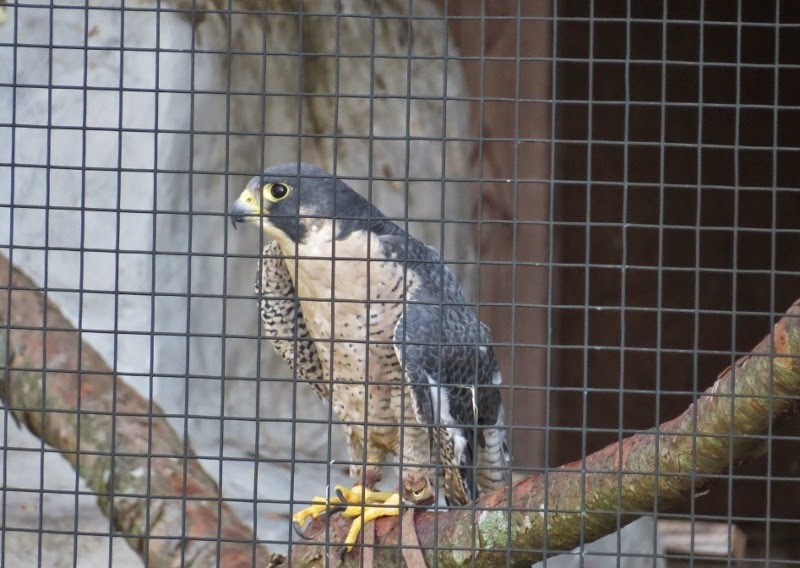 They also have a raptor aviary with hawks,owls, falcons, and a Bald Eagle which are unable to survive in the wild. 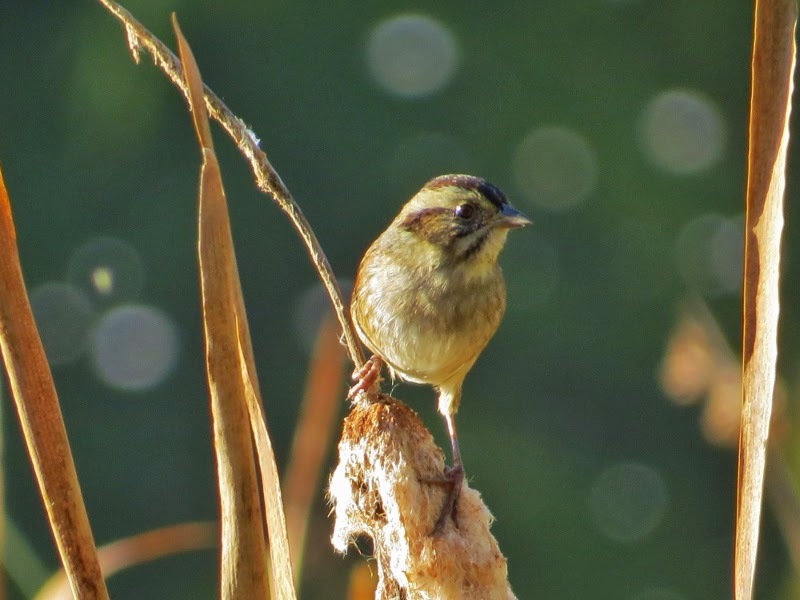 I caught a nice view of a Swamp Sparrow at the edge of the pond. 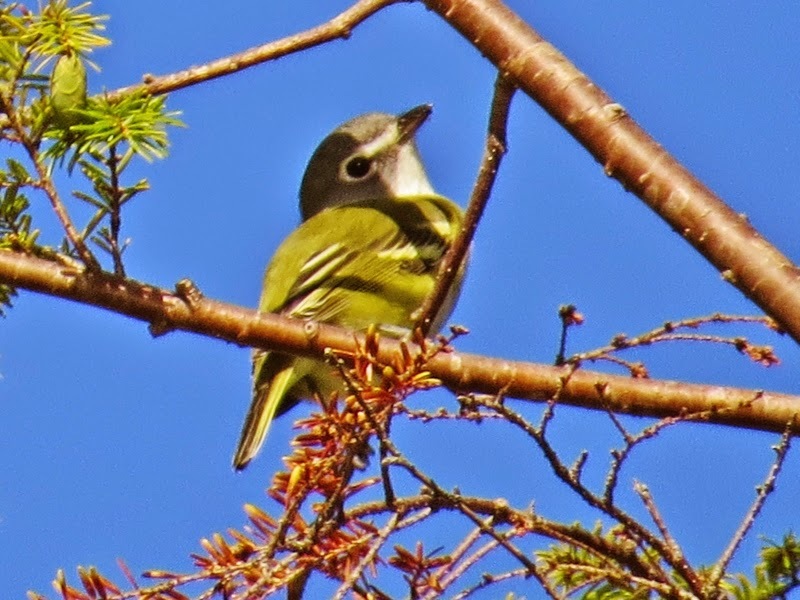 This Blue-headed Vireo was a nice find for me but I don't think I've ever seen one with so much green color! 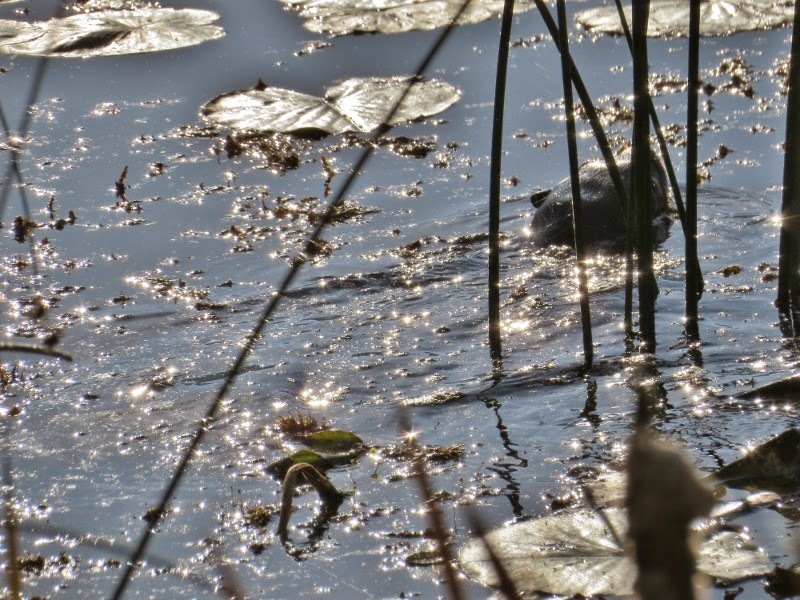 Another surprise was 2 animals that were swimming around in the reeds. They didn't allow me much of a view but they looked like otters. I've only seen otters maybe once or twice in my life so that was exciting. 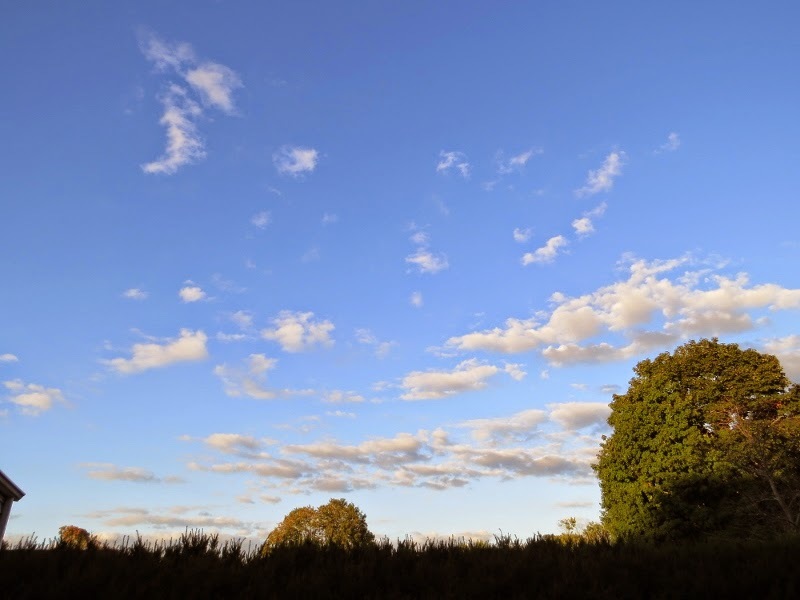 It was perfect weather and the scenery in Litchfield County is beautiful in the Fall. 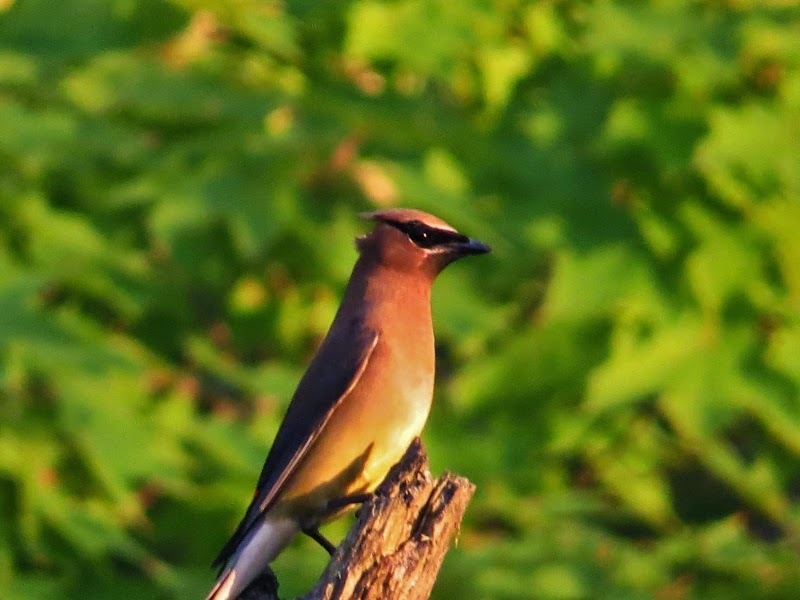 I spent a lot of time hiking up hills, checking out back road scenery, and visiting other parks such as Mowhawk Mountain but the highlight of my trip was my time spent at the Sharon Audubon Center. It was the perfect way to end the month of September. 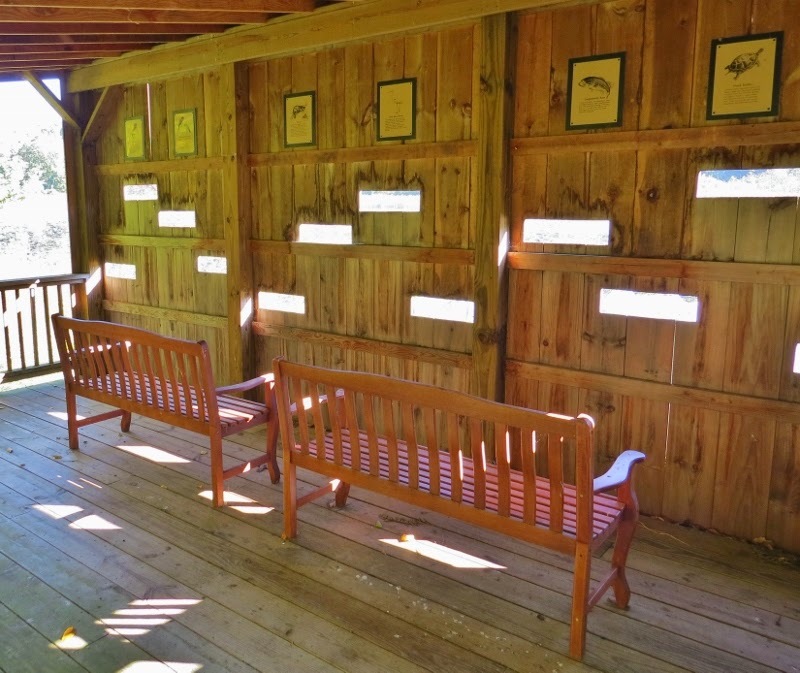 I recently visited the Walden Preserve in Salem Connecticut. 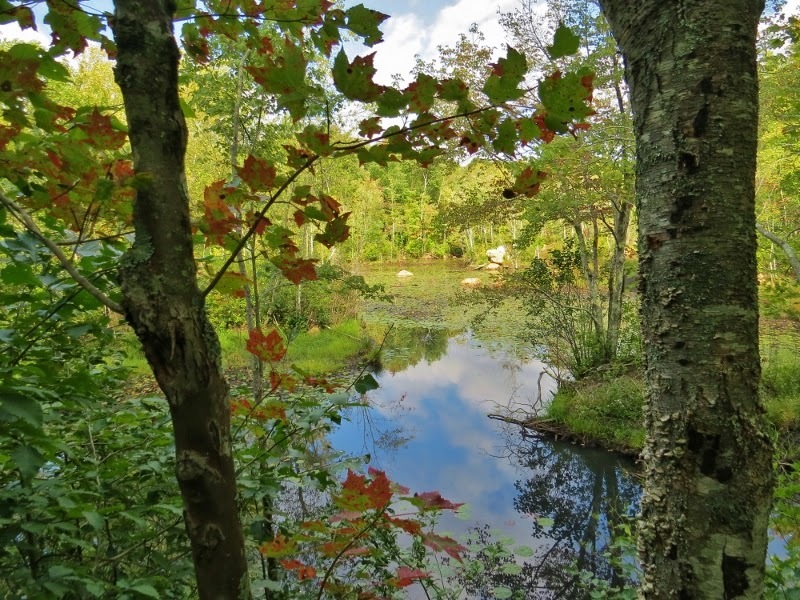 It is owned by the nature conservancy and managed by the Salem Land Trust. 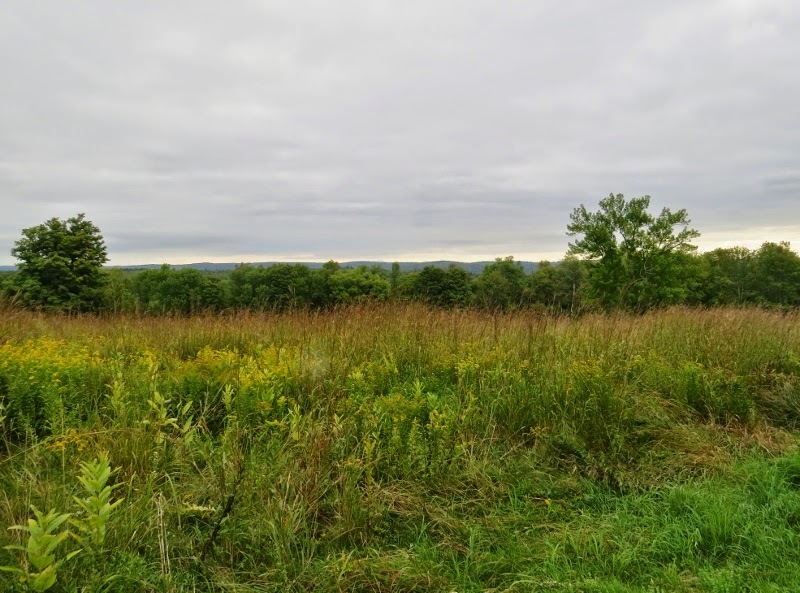 It contains 400 acres of fields,woodlands, streams as well as some small ponds and is also part of the 8 Mile River Watershed. I've heard from other birders that this an excellent place to visit during spring migration with plenty of warbler action but timing is everything and the birds were a little quiet during my visit. I'm guessing that in a few weeks there will be plenty of sparrows hopping around these weeds. 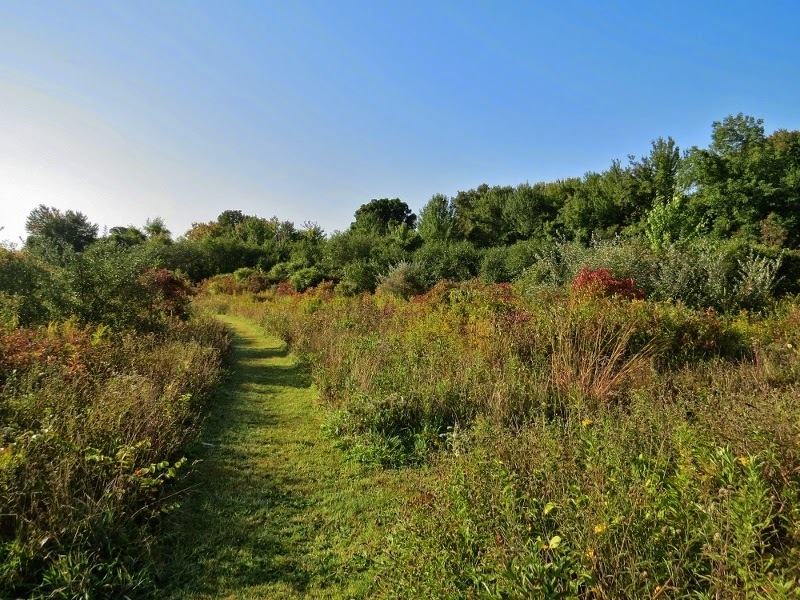 The grassy paths led me through fields of wildflowers like asters and the smell of wild grapes was so strong that I could actually taste them as I brushed past the vines. I found a Woolly Bear Caterpillar making its way through the grass. There's an old wives tail that you can tell how severe a winter is going to be based on the amount of black that these caterpillars have on their bands. 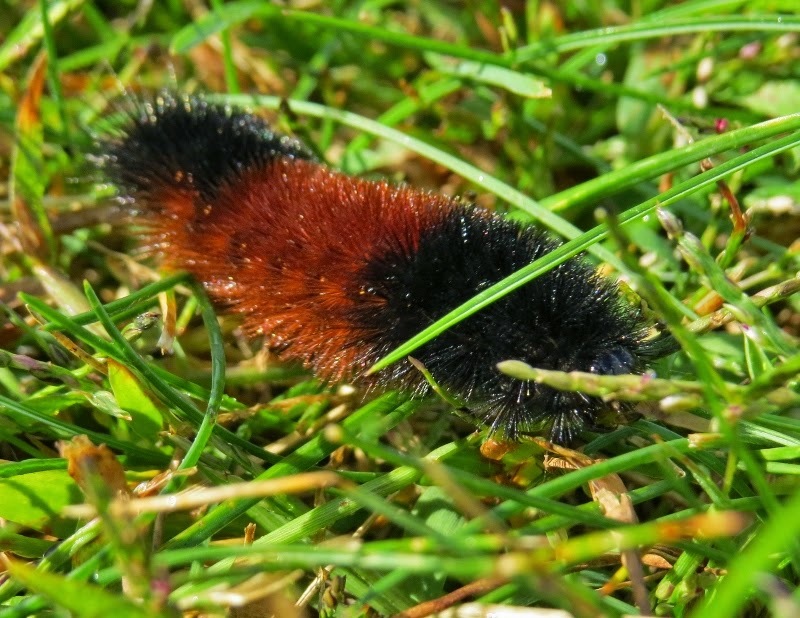 There are also several Woolly Bear fall festivals in the US and Canada. It just so happened that I was wearing brown pants and a black shirt on the morning I found him. I think we were kind of bonding. I didn't see much sparrow activity but sometimes I forget that an Eastern Towhee is actually a jumbo-sized variety of sparrow. 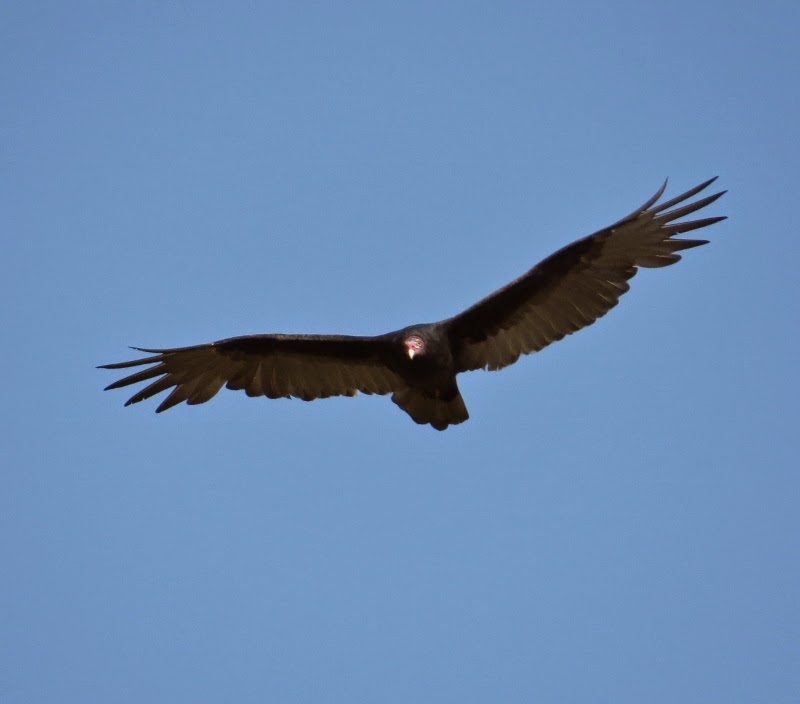 Both Turkey Vultures (above) and Black Vultures were flying overhead. I love the way their wingtips look when they are in flight. 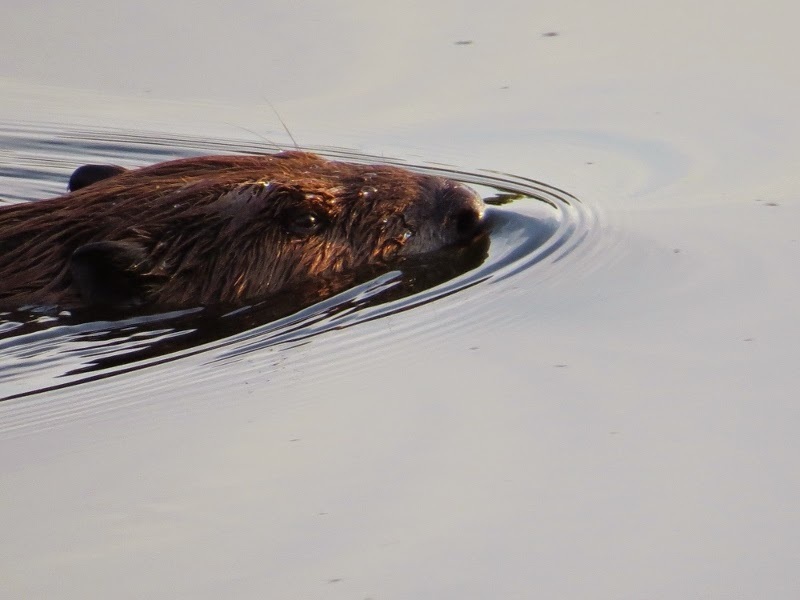 ....and a beaver tried to sneak past me without being noticed. Fall is in the air already...can you feel it? I spent some time hawk watching over the last couple of weeks. The top photo is a field in West Hartland where Paul Carrier hosts an annual Hawkwatch for the Hartford Audubon. There is a Hartland, East Hartland, and West Hartland CT. The population of all 3 towns put together can't be more than 2 or 3 thousand so it's kind of funny that they had to break it up into 3 towns. The day I attended there was a forecast for rain and the sky was mostly cloudy. That didn't stop the broadwings though. I saw about 500 before I had to leave at about 11am and they had a total exceeding 1,000 before the day was done. 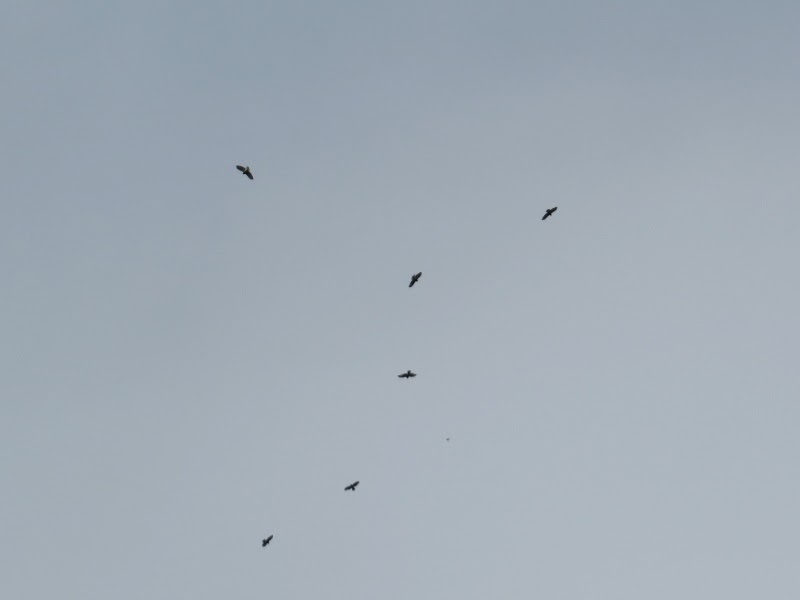 The biggest kettle I saw was about 150 hawks altogether. 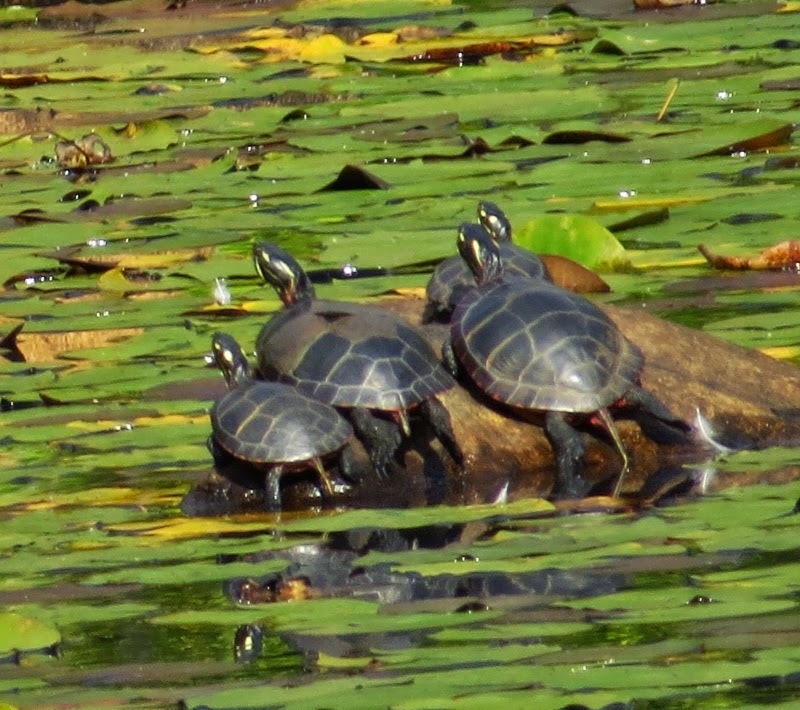 I like seeing the light- colored juveniles against a bright blue sky. 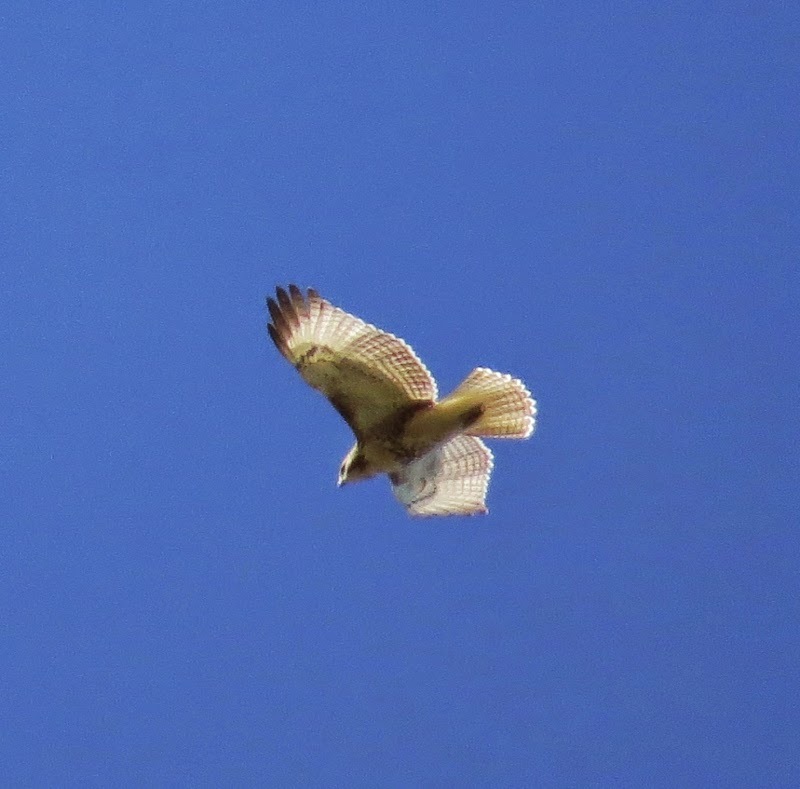 I was surprised to find out that red-tails are actually on the decline. Who would figure? I see them everywhere I go, especially on the top of the street lights on my way to work. 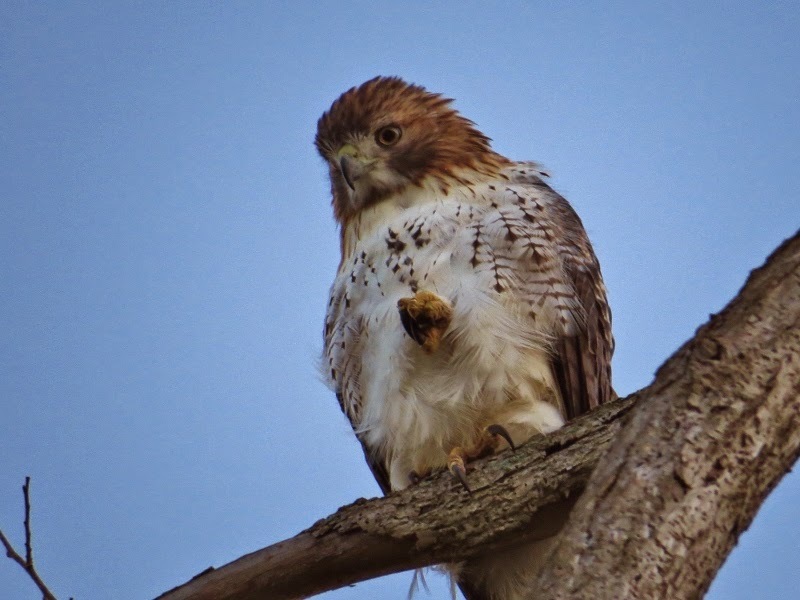 As I was hawk-watching in my backyard a couple of thoughts came to mind. One of those thoughts was that the sky is big. People have cathedral ceilings in their homes because it gives the room a greater sense of space. Rooms seem larger than they really are. Every day as we drive around we feel confined by the traffic and man-made structures around us but we should never forget what is above us. While sitting in my backyard searching for hawks it occurred to me that we all have free access to the largest cathedral ceiling in the universe......the sky. All we have to do is look up! Another hawkapiphany I had was that I have underrated my backyard as a birding spot. 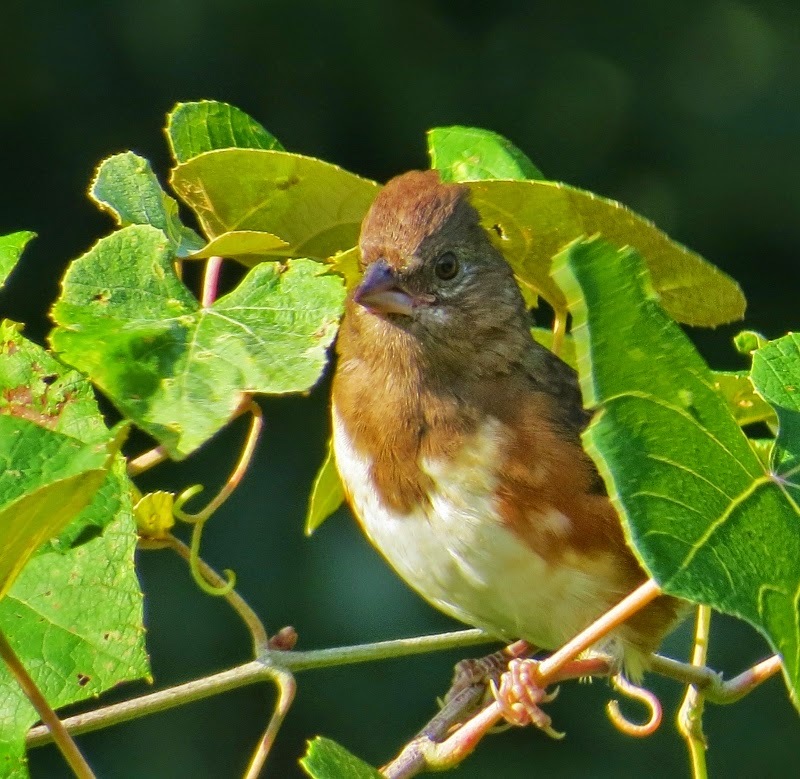 I've seen such a variety of birds over the years in my yard or flying above my house; Evening Grosbeaks, Rose-breasted Grosbeaks, Indigo Buntings, American kestrels, Peregrine Falcons, Red-shouldered Hawks, kettles of broad-wings, hummingbirds, Osprey, Snow Geese, Brown Creepers, Red-breasted Nuthatches, Pine Siskins, Purple Finches, ----and--I'm thinking the hawk in the hawk in the photo with the owl-like face and the white rump patch is a Northern Harrier. What do you think? We also get plenty of Bald Eagles throughout the year. 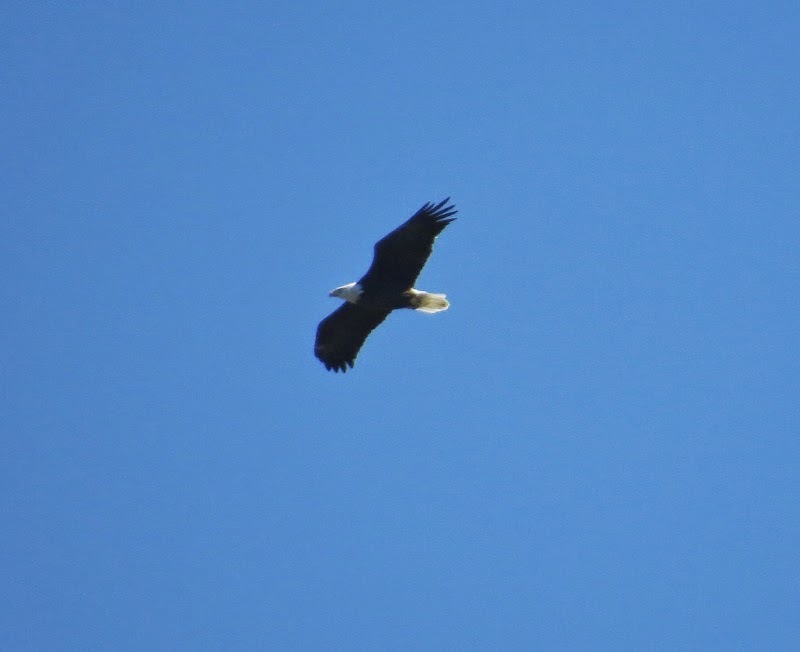 One thing for sure is that there's no mistaking an adult Bald Eagle! So what does the word hawkapiphany mean? It's just some word I made up. It sounds like a a mythological god using a combination of hawk and and the word epiphany. I like making up silly words for the fun of it because they sound good at the time. Then I leave it up to others to figure out what the meaning of it might be. I think that most people have some sort of routine that they follow from the time we wake up, do our chores, eat, exercise... et cetera. We might also have some self-imposed rules like no eating after 9pm for example, or maybe something more personal and specific. The positive impact of these routines is that it helps make our lives more efficient but if we don't allow ourselves flexibility then we might be building our own personal prisons. You might end up breaking your own rules and then feel guilty about it! I was contemplating all of this when it occurred to me that my connection with nature is very limited during the work week. Somewhere along the way I decided that I was too busy during the week so any birding or nature appreciation would have to be primarily reserved for weekends. 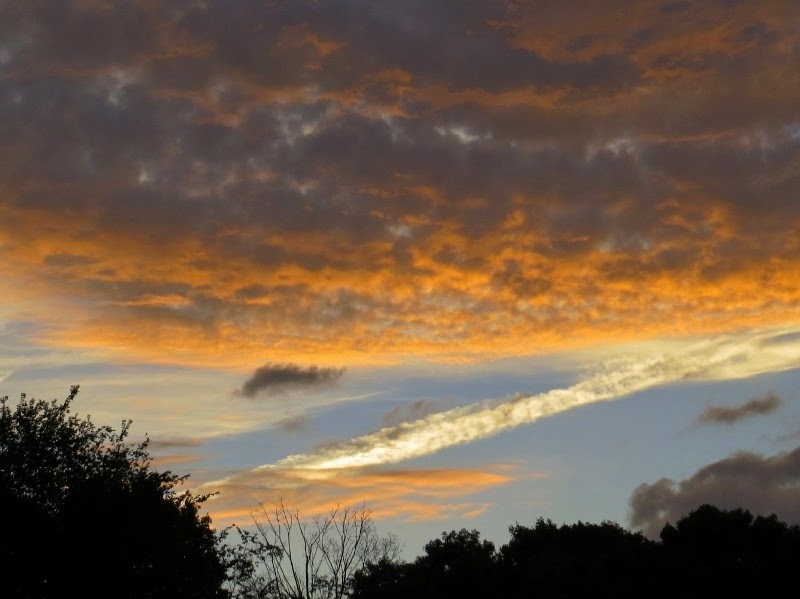 The truth is that sometimes even 5 minutes to appreciate the colors of the sky just after sunset. 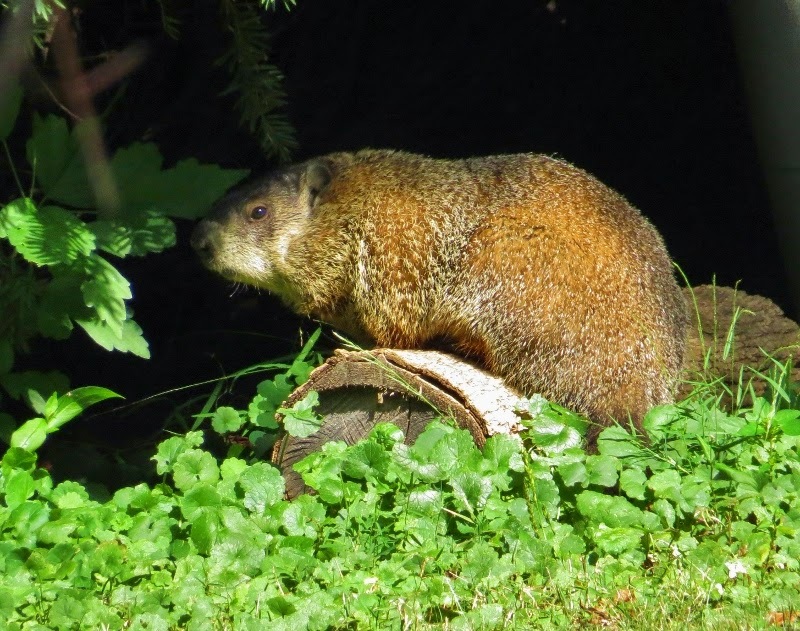 It only took 5 minutes to finally meet the woodchuck that fails to chuck wood but was very successful at eating half the vegetables in my garden this summer. I left for work 20 minutes early one day and brought along my camera. 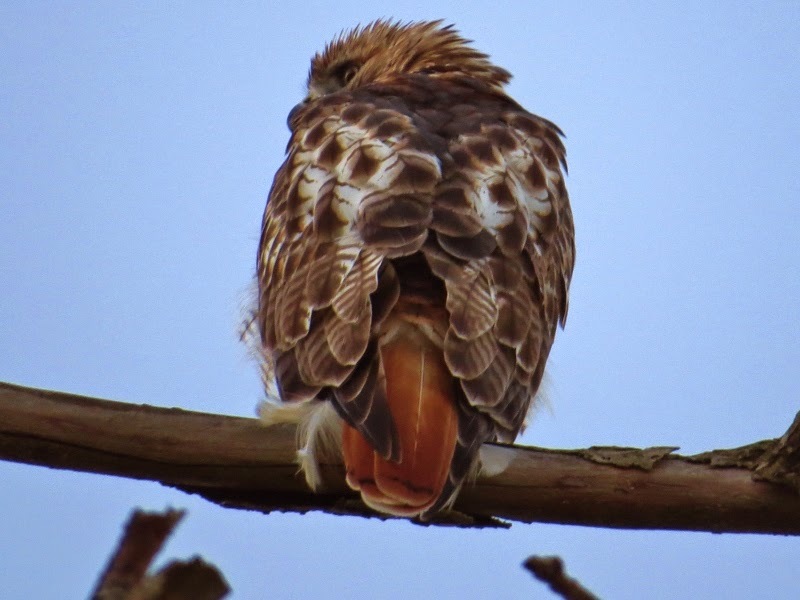 It was early enough that the Red-tailed hawk hadn't finished its morning stretching and didn't yet have the energy to fly away. I've never carried my camera to work with me because? I really don't know why. Early on I read that when taking pictures of birds you should try to focus on the head and make the eye the focal point. 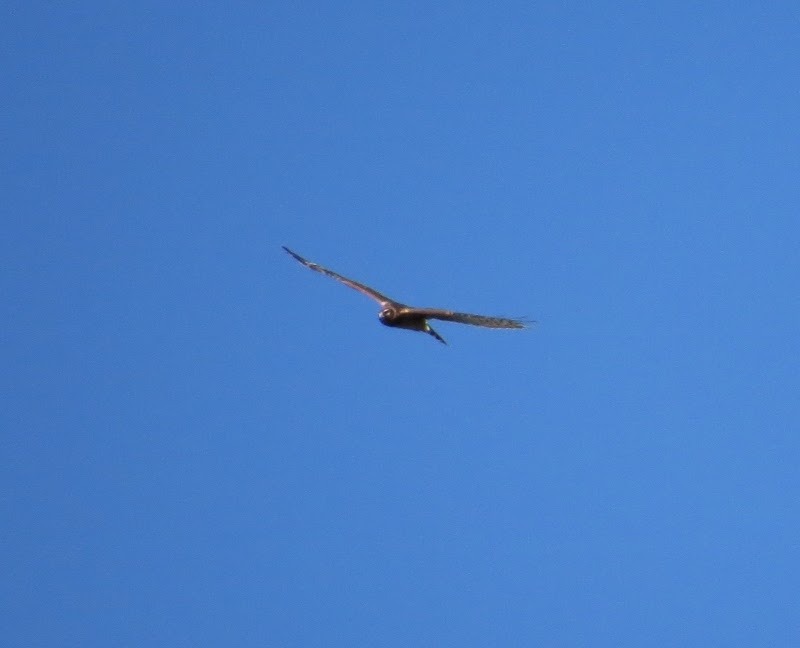 I've tried to follow that rule but what's wrong with taking a picture showing the reddish tail of a hawk? Another rule broken. I don't think I've ever bothered taking photos of birds after the sun has gone down but who can ignore a waxwing perched on a dead branch? Sometimes changing old routines and rules can open up new opportunities.